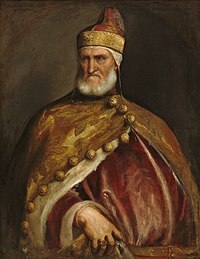 Andrea Gritti (1455 – December 1538) was the Doge of Venetian Republic from 1523 to 1538, following a distinguished diplomatic and military career. Gritti was born in Bardolino, near Verona. He spent much of his early life in Constantinople (Istanbul) as a grain merchant, looking after Venetian interests. In the late 1490s he was using his commercial correspondence for sending encoded information to Venice regarding the movements of the Turkish navy. In 1499, he was imprisoned on charges of espionage, but escaped execution due to his friendship with the vizier, and was released several years later. In the early sixteenth century, Venice lost nearly all its territory on the Italian mainland, and Gritti played an important part in the events connected with this loss and the eventual return to the status quo ante. In 1509, after the Venetian defeat at the Battle of Agnadello, Gritti was appointed as proveditor to the Venetian army in Treviso; ordered by the Council of Ten to support revolts against the invaders, he successfully engineered the return of Padua to Venetian hands, and its subsequent defence against the Emperor. In 1510, following the death of Niccolò di Pitigliano, Gritti took command of Venice's army, but was forced to withdraw to Venice by French advances. He continued as proveditor through end of the League of Cambrai and the subsequent war of the Holy League. In 1512, he led the negotiations with Francis I that resulted in Venice leaving the League and allying with France. Elected Doge in 1523, Gritti concluded a treaty with Charles V, ending Venice's active involvement in the Italian Wars. He attempted to maintain the neutrality of the Republic in the face of the continued struggle between Charles and Francis, urging both to turn their attention to the advances of the Ottoman Empire in Hungary. However, he could not prevent Suleiman I from attacking Corfu in 1537, drawing Venice into a new war with the Ottomans. His dogaressa was Benedetta Vendramin. Gritti died in December 1538. A portrait of Andrea Gritti sometimes appears in the loading screen of the PC strategy game, Europa Universalis IV. The Venetian Republic is a popular playable nation in the game. Finlay, Robert, "Fabius Maximus in Venice: Doge Andrea Gritti, the War of Cambrai, and the Rise of Habsburg Hegemony, 1509-1530," Renaissance Quarterly 53:988–1031, Winter 2000. ^ Gino Benzoni (2002). Dizionario Biografico degli Italiani - Volume 59. Treccani. ^ Labalme P.H. & Sanguineti White L. (eds.) (2008) Venice, cità excelentissima: selections from the Renaissance diaries of Marino Sanudo, Johns Hopkins University Press, Baltimore, pp. 232-235.